What quickly becomes apparent is that John Lennon’s melodic use of the Chromatic harmonica was probably more comfortable than his diatonic work. With the Chromatic he could skilfully sidestep the need for reed bending on the short harp, which was not something he had yet mastered in the early 1960’s. We’ve chosen to help you nail three tunes where John Lennon’s harp lines feature most strongly.. This is the perfect number for getting any group of beginners blowing and drawing a C diatonic for the first time. Harp teachers and workshop leaders take note. It’s in C major using straight harp, so grab your C diatonic and get ready. In 1964 the Beatles met Bob Dylan for the first time. It was a meeting that inspired a whole new level of songwriting for the band. I Should Have Known Better was an early result and the last Beatles song to feature harmonica in its opening bars. The history books also tell us it took Lennon three attempts to get the whole thing right. On the second attempt he dissolved into hysterics over his own harmonica playing. Here’s the tab for the basic lick. Note that Lennon tends to hold the harmonica with his right hand for the first line and uses the ‘toothbrush’ technique to achieve a trilled chord. Review the full track to see how often this phrase is repeated. 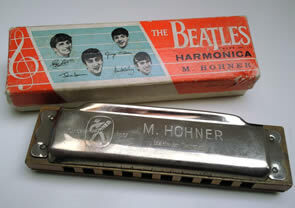 This was the Beatles’ first number one and again the harmonica provides a famous signature to the intro. Pat Missin has analysed the harmonica used on the track and concludes that it must have been an E major Chromatic. You can play the same riff using straight harp on an E major diatonic from 7B, but it will be an octave higher than the recording. Dropping down an octave to 4B on the same diatonic necessites a direct bend on 3D” to complete the riff which is not what we hear on the original recording either, but there are grounds to suggest Lennon may have used an Echo Vamper diatonic with its lower diatonic octave. For good measure however, here is the tab for a contemporary E major diatonic.. According to legend, this hit was written on the Helen Shapiro tour bus (the Beatles were a support act) on the way to sunny Shrewsbury. The result is a third example of a harmonica riff providing the memorable signature to a pop song. It only appears in three short bursts, but it is instantly recognisable. As with Please Please Me, the harp used may not be as obvious as you’d imagine. The song is played in C major, but using a contemporary 10 hole C diatonic from 4B would again necessitate a direct draw bend on 3D” to complete the phrase. Pat Missin’s conclusion is that an Echo Vamper with it’s extended lower octave may have been used from 7B; or else perhaps rather more likely a C major Chromatic. Venerable as I may be, I don’t possess an Echo Vamper so I’m going to open the tab firstly with a Lee Oskar Melody Maker labelled in G (remembering that G is the cross-harp key stamped on what is actually a C major instrument). This allows you to play the main riff on a diatonic instrument without that awkward 3D” bend. Then for a C Chromatic where again I’m using a Hohner CX12. The harmonica on these early hits served to accentuate the Beatles as being something new and distinctive. Please Please Me was only the third song they ever recorded (excluding the early Hamburg stuff and demos).. it started out life as a kind of doomy Roy Orbison rip-off, until Uncle George Martin decided they should speed it up, bang in the harmony vocals and, at the session, double up Harrison’s guitar riff on harp. “Congratulations, gentlemen, you’ve just made your first number one’, he said over the talkback once the song was complete .. and indeed they had. A couple of comments on the Beatles harmonica stuff. On “Please Please Me” you say “Pat Missin has analysed the harmonica used on the track and concludes that it must have been an E major Chromatic. ” Actually, it could have been either an E chrom, or an Echo Vamper in E. Impossible to be certain from the recording, but I suspect that an Echo Vamper in E might have been more readily obtainable in London back then than a Chromonica in E. However, impossible to be certain. Speaking of Echo Vampers, on “From Me To You” it could have been either a C chromatic or an Echo Vamper – not an Echo Super Vamper. The Echo Super Vamper was available in the standard range of keys from G to F#, so an Echo Super Vamper would have been an octave too high for this riff. The Echo Vamper was identical to the Marine Band 364 and was made in low C, which would fit this tune perfectly starting on 7 blow. As we know Lennon definitely had a chromatic in the key of C, then I suspect that this is what he used on this track, but again, it’s impossible to say with any certainty. For a couple of years now, I’ve been meaning to add audio clips and tablature to my Beatles harmonica page, but you’ve saved me the job! I’ll just add a link to your pages, if that’s OK. I must admit I’ve never really understood why the bigger harp with more holes was just the plain old Echo Vamper, but the smaller harp with fewer holes was deemed to be “Super”. There is also another song by the Beatles that uses a chord harmonica much the same as “Being for the Benefit of Mr. Kite” called “Fool on the Hill” off of “Magical Mystery Tour”. There is also a song off of Lennon’s 1971 solo album “Imagine” called “Oh Yoko” that has harp that sounds much like “Rocky Racoon”. En el solo de guitarra de I SHOULD HAVE KNOWN BETTER NOW la armónica suena como el principio de la canción, pero antes de terminar el solo, la tonalidad cambia de DO (C) a RE (D) y se escucha a la armónica tocando las notas RE – FA# antes de cambiar a SOL7. ¿Como Lennon puede presionar RE – FA# con una armónica en C? ¿O graba estas notas con una armónica en D? Using Google Translate: In the guitar solo I SHOULD HAVE KNOWN BETTER, the harmonica sounds like the beginning of the song, but before finishing the solo, the key changes to DO (C) RE (D) and is heard playing the RE notes (F#) before switching to SOL 7. How can Lennon press RE (F#) with a harmonica in C? Or did he record these notes with a harmonica in D? Speaking of the “Echo Vamper”, there is a video on Youtube with Sonny Boy Williamson II playing an “Echo Vamper” on “Bye Bye Bird”. plese im interested in beatles songs just for my echo hohner in key C. could you give a link with that particular tabs? ??? Hi Luis. I don’t have anything I can point you straight to. But if you search out a particular Beatles song title and harp tab on the net, I am sure you’ll find what you need. Joe – thank you for visiting. Your comments are very welcome. Keep coming back. And do let us know if there is anything in particular you’d like us to cover. I would like to know what harmonica John Lennon is playing in I’m a Loser? Short answer – a C major diatonic blues harp in 2nd (Cross Harp) position. He’s playing along to the key of G major, focussing on draw notes. The harp sequences come in two 10 second hits at 1:15 and 2:10. The playing is quite crude, no single note playing, but folky style groups of notes, amongst which the melody is discernable. Lennon himself admitted this was him in his Dylan period. He ends each harp sequence on a low, rattling, draw 1 bend (D) which echoes the low G of the vocal line – an unusual excursion into baritone vocal register for a singer who usually hit the tenor range. The song was written in 1964 and appeared on the Beatles For Sale album. It was going to be released as a single, however I Feel Fine took its place. Does anybody knows why Hohner didn’t manufacturing Echo Super Vampers anymore? People want to play Beatle songs and make them sound as original as possible. Crazy world. Thanks to Rickenbacker, Gretsch, Gibson an another trade marks which ones makes the dream still cross generations. OK….that all you had to say? If so, Allelujah bro! Would you please tab – There’s a Place? I think it is on a C Chromatic? Omar – I’m frowning and growling at you, but with a friendly glint in my eye. My gut response is, ‘figure it out for yourself amigo, John Lennon had to!’. My second response is, ‘what exactly do you want to be tabbed; the harp parts are a mess…?’. It’s like giving someone a bucket of live eels and asking them to draw the contents for you. Ain’t gonna happen. And furthermore, what your ears tell you you’re hearing will probably be different to what I’m hearing, and the next guy. HOWEVER, as I’m such a nice man, I’m working on an explanation of what Lennon himself called his Bob Dylan phase; it may include a ‘guide tab’, so watch this space and tell all your friends! Great article. Surely From me To you tab for G harmonica is wrong? Opening riff should be 5d 6b 6d 6b 5d 6b 6b 4d. I’ve never played a C chromatic. Is it possible to get the low A (that ends the opening riff) on chromatic without having to bend? Thanks for this lovely anecdote Eddie. Does your friend still have it? GH being George Harrison? Hi Motrcycleboy. You’d be right if we were playing a regular 10 hole G diatonic harp. It’s Dorian Mode, or 3rd position. Perhaps I missed a trick here. But I also chose a G Lee Oskar MELODY MAKER in the example, just to be awkward! So the tuning’s different. The tab should be correct for a Melody Maker harp. I just checked your chromatic query too, and yes it is possible. Thanks for your valuable input. I Should Have Known Better was relesead in july and they met with Bob Dylan one month later. So, get your trivia Beatles facts straight. Uh oh, Beatles police. Hi Dimitri, I’ll do my best mate. Get your manners sorted too and we’ll be about even. Does anyone anywhere have the Harmonica Tab for Rocky Raccoon? I have looked but have found nothing. Any help would be truly appreciated!!!! I suspect the fact there’s no tab out there is because it’s just too tuff to tab. The harp is way back in the mix and it’s played in a busking style (mostly chords and chugs, rather than single notes that can be tabbed out readily). There are also other instruments that compete with the register of harp line later on, to the point that it’s difficult to differentiate one from the other. Whoever starts to tab out what they think is in the harp mix is almost certainly setting themselves up for counter comment and disagreement. My best advice is that it definitely played in 1st Position on a C harp at the upper mid end of the harp. You just have to busk along and try to emulate what you hear. I doubt anybody would risk stepping forward and telling you ‘no, no. no, it goes like this..’. If they do, they’ve started a circular debate and should be prepared to back up their claims with inalienable proof. For now I’ll suggest loosely chugging this chord pattern 5B-6B-7B 5D-6D-7D 5B-6B-7B 4D-5D-6D 4B-5B-5B 4D-5D-6D 5B-6B-7B. Take this and your C harp and start experimenting Scott. Good luck! Re: the Beatles policing going on above from Dimitri. The facts are indisputable. But of course the Beatles didn’t have to have met Dylan to be influenced by him. Given that four Dylan Bob albums had been released before their meeting in the Delmonico Hotel on 28th August 1964, and three of them had seen the light of day before Hard Day’s Night (including I Should Have Known Better) hit the streets.. well, the influence is in the grooves. Dear Sir..What type harmonica and in what key for the song There’s a place. Just listening to “I’ll Get You In The End” and I can hear what you mean about being way out of tune but if it sounded bad for the song I’m sure George Martin would he said something. He probably did but John pointed out it fit the mood of the song or something.